Slow cookers are made for autumn. 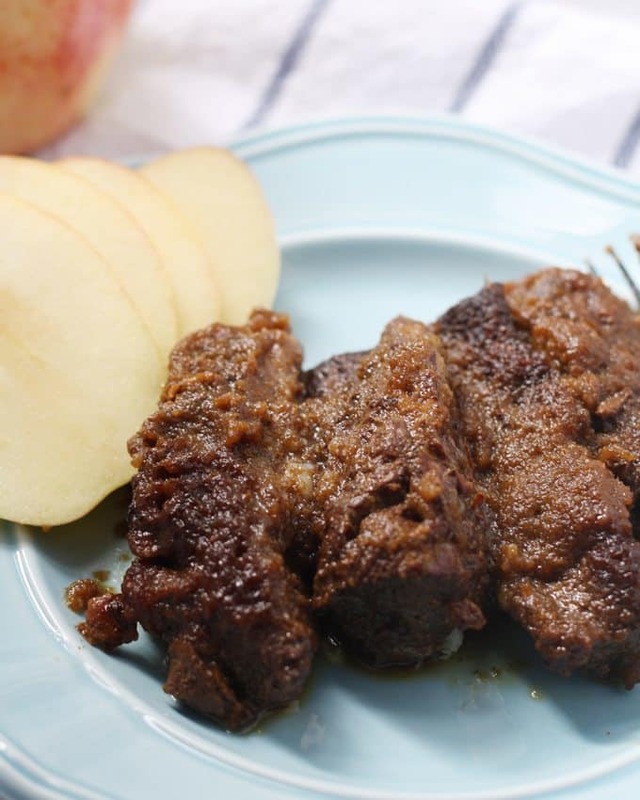 Try out my recipe for slow cooker boneless apple short ribs – it’s easy and delicious! I’m so happy I can’t even explain it to you without confusing you and not making sense. I am truly not a summer person and while this was the summer of my dreams, I’m happy I can pull out my sweatshirts and sweaters and my slow cooker. Yeah, I had to throw that in there about my slow cooker. I had every intention of taking it out over the summer but because it was so cool, I didn’t as much as I normally do. Usually its way too warm to stand in the kitchen over the stove and in front of the oven but I can only recall this summer’s hot uncomfortable days on one hand. I kept my slow cookers on the shelf the past few months and I have a new plan for the upcoming autumn/winter/spring seasons. I’m going to do lots of baking of sweets and goodies and use my slow cooker so I can stay out of the hot kitchen. Score for everyone! And before I forget (like I could), today is also Mr. B’s birthday. Happy Birthday boo! Mr. B loves ribs and last week I sent him to the grocery store, list in hand. For some reason I decided last week was a good one to try my hand at cooking short ribs. I get these ideas in my head sometimes, and there’s no getting them out until I do something about it. I don’t know if the store only had boneless short ribs, or if Mr. B. grabbed those because he knows I hate eating food off of a bone. Either way, he bought boneless short ribs and I had to do some research as to what to do with them. I read these two recipes (one, two) and used them to guide me along my way. 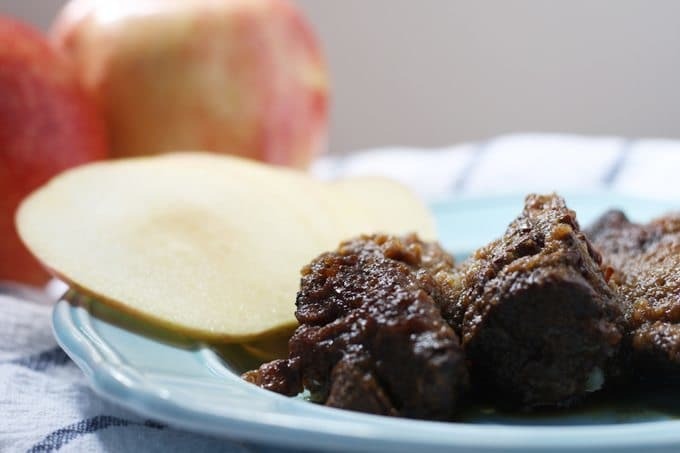 Apples and autumn obviously go well together, and I thought I would give that a try here with the boneless short ribs. Season all sides of the short ribs liberally with salt and pepper. Brown the outside of the short ribs in a pan and place them in the bottom of the slow cooker. In a food processor or blender, combine the apples, vinegar, soy sauce, garlic and scallions. Process until the mixture is well combined and thick. Pour evenly over the short ribs. 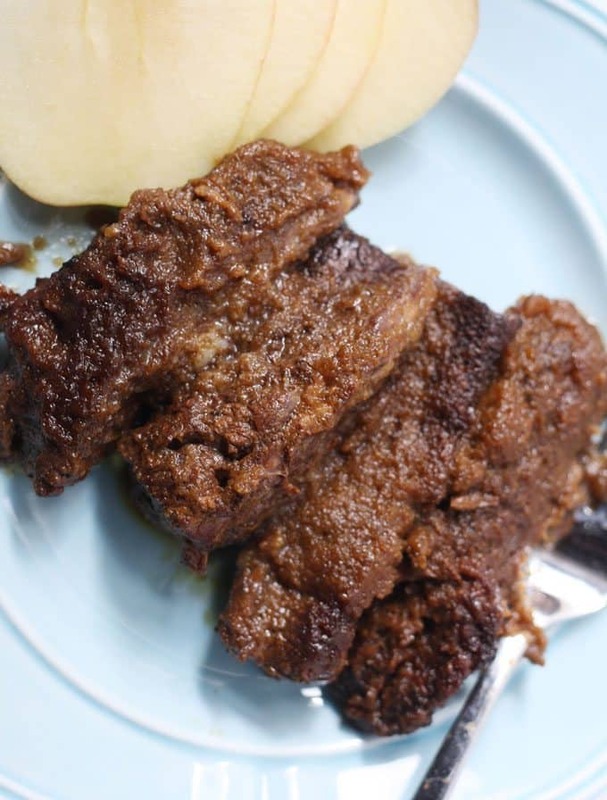 Cook on low for 6 hours or until the short ribs are fully cooked and tender. Serve with additional apple slices. If you increase the amount of short ribs, increase the cooking time by 1-2 hours. Modified from Nom Nom Paleo and Gourmet Girl Cooks. This is excellent for this time of year, and I’m a fan of crockpot recipes. Thank you so much. I don’t have a slow cooker myself but my mom does, and I am sure this will be a hit! I will be forwarding this to her and requesting it for our next family get together dinner! Thanks! i am absolutely going to try it! 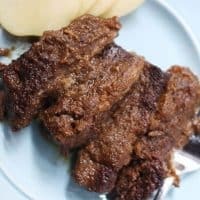 Slow Cooker Boneless Apple Short Ribs looks so delicious and now I am hungry. The name sounds very interesting! I have to try this one. Another great one! I hope you do! It’s a pretty easy recipe and totally delicious! I love good short ribs. Many people just do not fix them correctly. I love this recipe, as I must confess I have tried it, and have added it to my own collection of recipes. It is so mouthwatering and there were no leftovers. i love it it looks so tasty and i love the ease of slow cooker recipes. I will definitely try these! Thank you for sharing! This looks amazing! Makes me want to pull out my slow cooker immediately! Looks delicious. I want to dig in already. This looks incredible! I can’t wait to make it for my family and friends! !